Having computer problems but are unable to make it out to our store? Allow us to connect to your computer remotely. In many cases we will be able to resolve your issue without the need of bringing your computer into our shop. Remote Assistance is billed at a reduced rate of $65 an hour. The user must first call Computers, Inc. at 410-823-2829, and speak to a Support Agent. 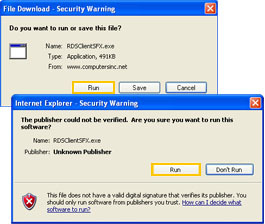 Click the "Run" button on the File Download box. Click the "Run" button again once the download completes. Enter the Agent Number that our Support Agent provides you over the phone. Select the checkbox next to "I agree to the terms and conditions:"
We should now be connected to your system. Please do not move your mouse while we work on your computer.